The Regolith X-ray Imaging Spectrometer, REXIS is a Harvard-MIT joint student collaboration experiment on the OSIRIS-REx asteroid sample return mission. OSIRIS-REx is an asteroid sample return mission carrying a diverse collection of sensors and instruments to explore the asteroid 1999 RQ36. 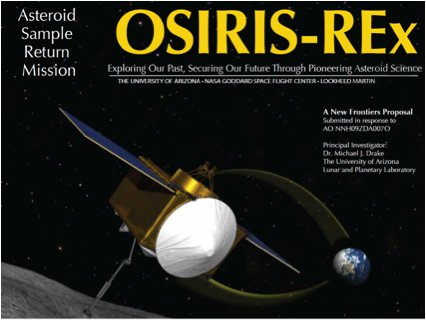 The OSIRIS-REx mission is the winner of the NASA New Frontiers 3 program. The OSIRIS-REx spacecraft is scheduled for launch in September 2016. It will cruise to the asteroid for approximately three years. Upon arrival at the asteroid in late 2019, the spacecraft will collect data to produce a detailed map of the surface from various orbits and distances. In early 2020, the spacecraft will land on the asteroid for sample collection. Up to three sampling attempts can be made. After sampling, the spacecraft will begin its cruise back to Earth with sample retrieval expected in 2023. For an opportunity for Harvard undergrads to design/build REXIS, check out cross registeration for a class at MIT (16.831/12.431), or click here for more info.